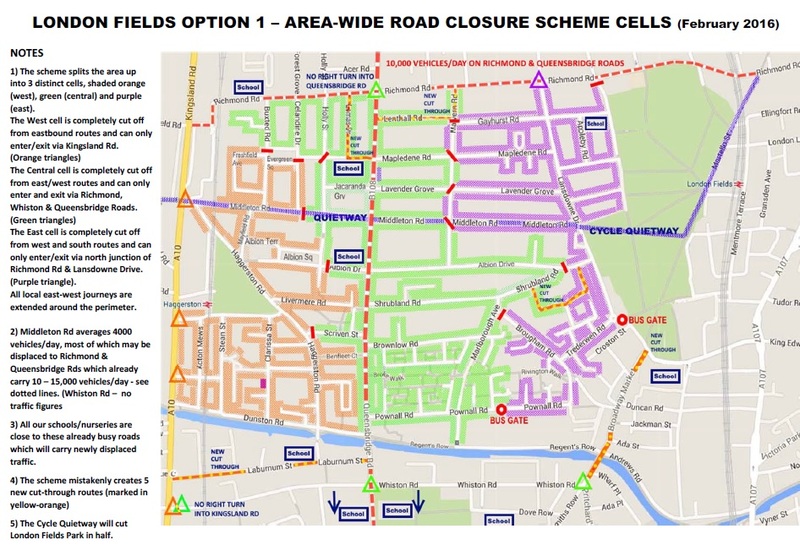 If you've been approached recently by cycle campaigners on-line, or on Broadway Market and Queensbridge Road, you will be aware of the traffic planning scheme to install 13 road blocks in the London Fields area and to create, as its centerpiece, a cyclists Quietway along Middleton Road. You might also have seen local residents arguing with the cycle campaigners and read the recent story in the Hackney Citizen. The planned TfL Quietway has turned into a massive local row. 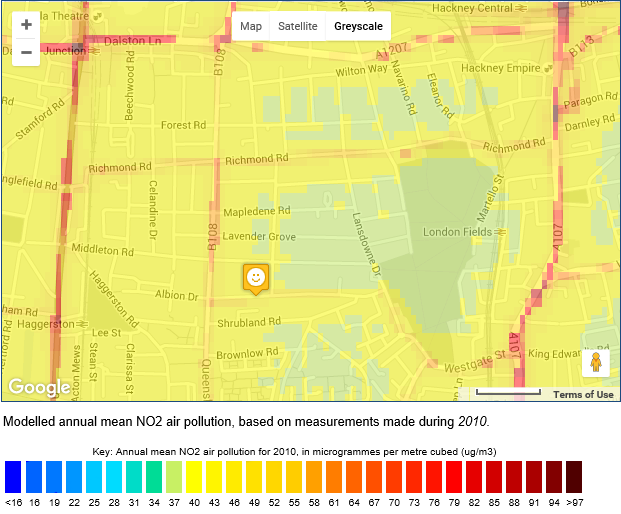 This map is a snapshot of annual mean air pollution in the London Fields area based on 2010 data. 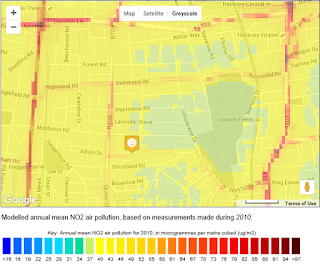 The red and orange corridors show that Mare Street, Richmond Road and Queensbridge Road exceeded the World Health Organisation's, and the EU Directive limit for safe air , namely 40ug/m3 for nitrogen dioxide (NO2) - a poisonous and carcinogenic gas produced by vehicles. The new Quiteway cycle routes are part of the GLA Mayor's policies, and Transport for London's plans, to promote cycling and discourage driving in London which in some places, frequently, suffer from the highest level of air pollution of any world city. 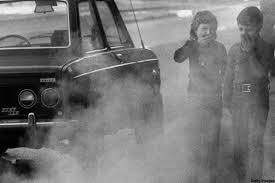 It is estimated that at least 9,000 Londoners suffer early deaths every year from air pollution. Research has shown that children exposed to air pollution are the most vulnerable to intellectual and physical detriments including higher incidences of asthma and other chronic diseases like strokes, heart disease and cancer. But the massive local row isn't between car owners and cyclists, nor about the lifetime illnesses which traffic pollution causes. 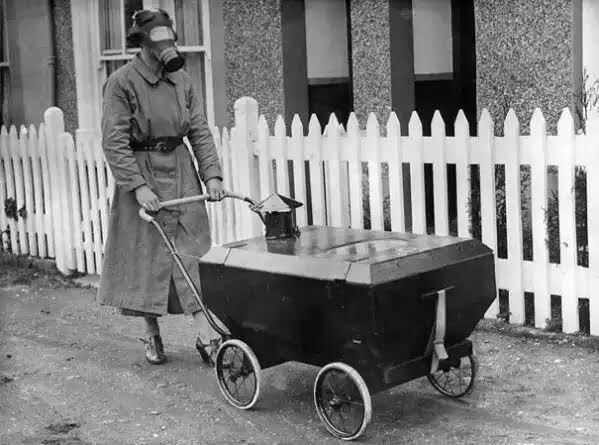 No one wants fume filled streets. The row is about the transparency of the traffic planning process and whether construction of up to 13 roadblocks will make a bad thing even worse. The general public first became aware of TfLs plans, for the construction of the Wathamstow to Bloomsbury Cycle Quietway route, from a press release in December 2014. TfLs agent, Sustrans, had been working with local Council's and the London Cycling Campaign for over a year previously on the plans. Sustrans were later awarded the 3 year contract, after OJEC public advertisement, to implement the Quietways. TfL publically states that Quietway route consultations will be carried out by Council's locally. 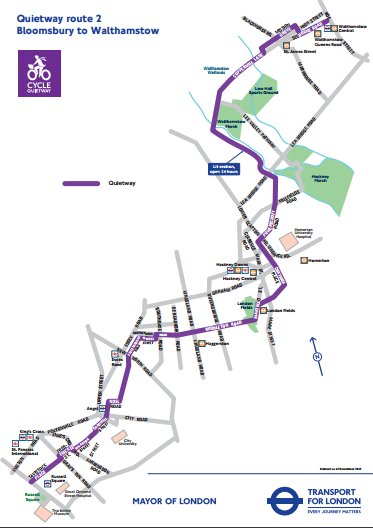 But Hackney's consultation is not about the route. 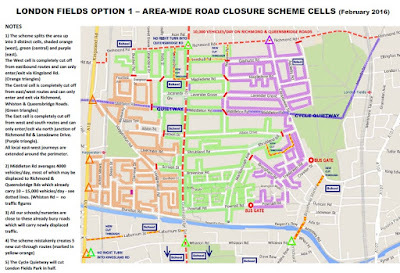 Local residents and park users are not being consulted about the the carve up through London Fields (already used by up to 4,000 cyclists per day) and whether it should run along Middleton Road. Hackney Consultation is limited to whether to instal up to thirteen road blocks around the Middleton Road route. "Just tell them its common land and so we can do whatever we want with it"
London Fields is common land, also called Lammas Land, like the lands that were requisitioned by the GLA for the London 2012 Olympics. London's common land is protected by the Metropolitan Commons Act 1866. The Bye Laws for Hackney's public open spaces forbid cycling and building structures on them without express Council permission. The exclusion of the commoners from any part of the common land would first require a local inquiry by the Secretary of State. 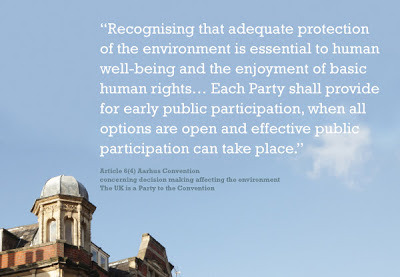 Hackney's consultation presents a number of Options. Option 1 proposes thirteen roadblocks, and two bus gates, which divide the area into 3 'cells', which preclude through traffic crossing the area, but enables local residents to have access via a limited number of entry/exit points. This option is opposed by four local residents' associations but supported by TfL and the Council. Cycle campaigners argue roadblocks are needed to ensure a safe Quietway route for cyclists of all abilities along Middleton Road . Such was Hackney's enthusiasm to be one of the first London Councils to have a Quietway, it decided to immediately implement all thirteen roadblocks, and divide London Fields, as a "trial". Without any public consultation at all. 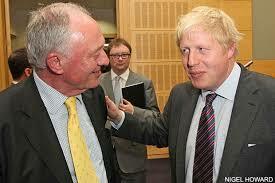 There were red faces all round and an embarrassing climb down when the Council was faced with democratic outrage. Unless drivers switch to other modes of transport (walking, cycling buses etc) the Option1 roadblocks will inevitably increase the distances travelled by local and through traffic to reach their destinations, and so increase air pollution generally. 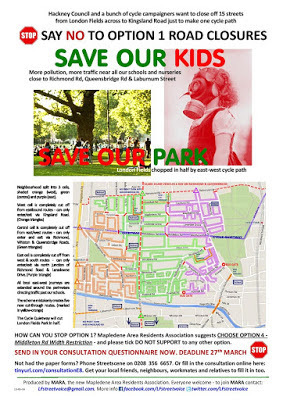 This illustration was produced by the Mapledene Area Residents Association to highlight its concerns, regarding increased air pollution, and increased cycle traffic across the London Fields common land. It recommends Option 4 - width restriction on Middleton Road to stop HGVs using it. 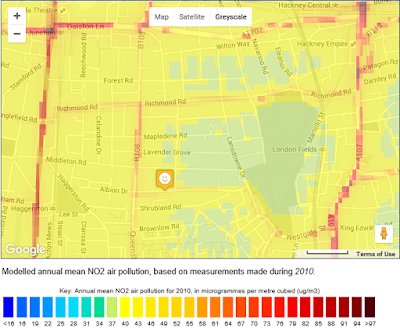 Another effect of the roadblocks will be to concentrate traffic, and its pollution, by pushing significantly more vehicles onto unrestricted roads, particularly Richmond and Queensbridge Roads which are not only already the most polluted roads locally but also where many schools and nurseries are situated. You can read the Council's documents and make your views known to them about the London Fields scheme here. NOTE: public consultation closes at midnight Easter Sunday 27th March 2016. The Council's consultation does not suggest any Quietway route except Middleton Road, although Albion Drive already has about 50% less traffic than the minimum for a Quietway, whilst Middleton Road has about 100% more. Hence the need for 13 roadblocks to make a safe Middleton Quietway possible - which is the route already upon decided by the authorities.